Well, I'm not sure if that dream I had came true. 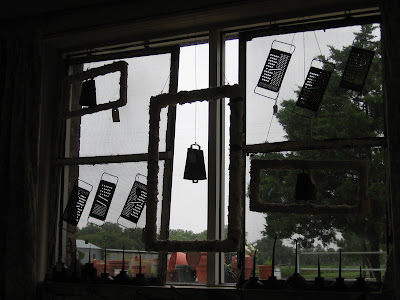 But, I was able to get up to the store this morning and reset the window with oil cans, cow bells and cheese graters. What do you think? I later made it to the dentist who seemed unsure that my useless tooth is causing the vertigo. But, I have no doubt it is from the tooth. And that tooth must come out. After an attempted root canal yesterday, I was sent home with some major pain drugs. I am set to see the oral surgeon tomorrow. Maybe these drugs will give me more dreams of inspiration! Ah! And a Big as Texas THANKS to Cher (http://thetexaswoman.blogspot.com/)! She awarded my blog a heart, which I so VERY much appreciate. You rock, Cher! 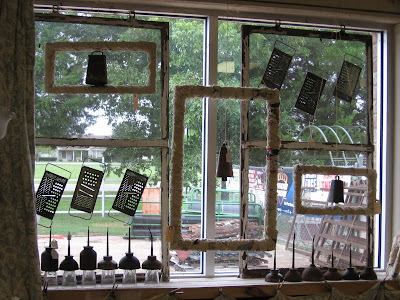 I really like the new window display! Nicely done, love!